Warmer weather has arrived, bringing with it my craving for ice cream, which seems to go into remission over the winter but comes back with a vengeance when the temp goes over 80. I don’t own an ice cream maker, and I when I get near the vegan ice cream section of the grocery store, I look the other way, so when the craving for a decadent frozen treat hits, I have only one recourse: Pull out the frozen fruit and get to blending! My daughter E says I’ve become “too weird” lately because I’ve been putting greens into my frozen desserts. I like the idea of getting a little extra nutrition in my daily dose of decadence, but I leave the spinach out when E’s partaking because she says she doesn’t believe in blended vegetables. (My rejoinder, “I don’t believe in the Easter Bunny, but you still get a basket of candy every year,” doesn’t impress her.) Honestly, if she would just give it a try, she would never notice the spinach in this chocolate-cherry treat. Kale is another story, though, and something I recommend only to hard-core veterans of blended greens. I make this using my beloved Vitamix, though a food processor will work with a lot of starting and stopping and scraping down the sides. I’m not sure how well a food processor will handle spinach, however, so you might be wise to stick to all fruit in the processor or your Ice Cream may actually be Ice Green. If you’re used to greens in your sweets, you can use kale leaves (ribs removed) instead of spinach, but if this is the first time you’ve added greens to a dessert, stick to spinach–you won’t know it’s there. 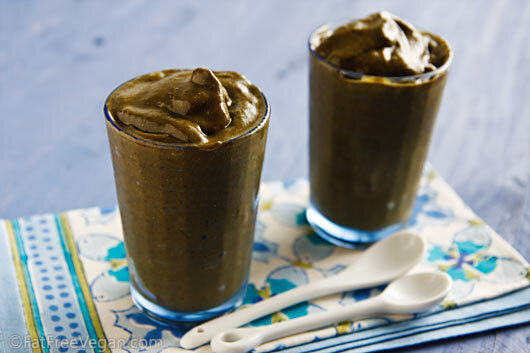 Place ingredients into high-speed blender in the order listed (a food processor may work if you omit the spinach). Begin blending on low and gradually increase the speed until you’re on the highest setting. If your blender has a tamper, use it to push the fruit into the blades. (This will be loud, so don’t worry if it sounds like a jackhammer fighting with a chain saw.) Blend until smooth but don’t over-blend or the friction will melt your Ice Dream. If that happens, call it a smoothie and use a straw. This soft-serve dessert tastes best made fresh, but if you have to, you can freeze any leftovers. Allow to thaw slightly before stirring and serving (a few seconds in the microwave will speed this up.) I don’t recommend dividing the recipe in half or doubling it because it becomes difficult to blend. Nutritional information uses unsweetened plain soy milk that contains 45 calories and 2.25 grams of fat per half cup; other non-dairy milks may have more or less of all nutrients. Disclosure: Amazon links are to products I actually use. When you buy something through them, a few pennies on each dollar goes to support my work on this site. How big are your serving sizes? 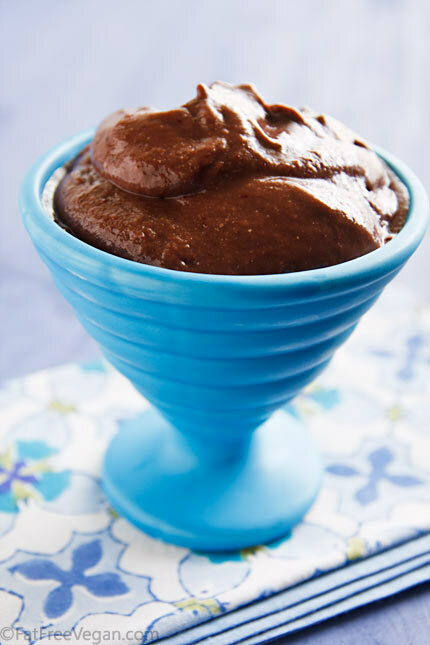 I love using frozen bananas for “ice cream.” I will have to try this one with the frozen cherries and chocolate. It sounds yummy. My question….how big are the serving sizes for this recipe? I’m curious if it’s a cup, a half cup, or what for the calories listed? I always see calories per serving but never how big the serving size is supposed to be for those calories. I’m just curious. Laina, it came out to just over 1 cup per serving. We have an ice cream maker and this looks like a recipe that would work well in that. Ever tried it that way? In any case, looks delicious! Could I make this in my Vita-Mix then freeze in an ice-cream maker or would the ingredients need to change? Brenda, I’m afraid I’ve never used an ice cream maker, so I can’t offer any guidance on it. I can’t see how it would hurt it, though. Susan, This is one of my all-time favorite foods. Check it out with walnut butter, almond butter, hemp seeds on top, and arugula as the greens! Susan, this looks yummy, even with the spinach. 🙂 I will try when cherry season comes around. (mine will be carob though). Thanks! Ahhhh. Cherries and Chocolate are my favorite combo! You are brave walking right by that Ice cream case, I keep buying those “So Delicious Coconut Fudge Bars” the ingredient list is short and at 70 or 80 calories, it’s an excellent treat. However, this looks even better…and cheaper! Oh my…I want to make and then eat this right now! What a healthy and scrumptious homemade ice cream and I love your addition of spinach and chia seeds to the recipe! Raw spinach always leaves a weird feeling on my teeth… which is fine after a salad but combine with the frozen element might be odd, so I might try this with kale or arugula! Susan, how do you grind your chia seeds? I’ve ground them before in my coffee grinder, and I found them to be quite bitter that way. Maybe it’s my grinding method?… I suppose you add the chia seeds to thicken the ice cream? Thanks in advance! I just grind them in the blender and I haven’t noticed any bitterness, but if that’s a problem, you can always put them in unground. The blending will grind them well enough. You can just use more cherries instead of the banana or substitute another fruit. Mango and pineapple taste good, though if you want a purely cherry taste, stick to them. Thanks for this no banana recommendation! I’m allergic to them and always have a tough time making vegan smoothies and such nice and creamy. Do you have any tricks for helping with that? If you use frozen kale, specifically blue curled kale from Whole foods, no difference in noticed between raw spinach and kale. A bit heavy on the fruit, but it is heavenly. This looks yummy! I love the idea of using a frozen banana. Slightly off topic, but do you have any ideas for using frozen persimmons? Trader Joe’s has them and I’d like to make cookies or a cake or something with them. I am just not sure where to begin. Thanks! Just wanted to let you know that I made this today and it was delicious! (I actually used spinach instead of kale.) I have made quite a few of your recipes and they have ALL been excellent! 🙂 Thanks so much!!! Could I switch out frozen spinach for the fresh? If so, how much should I add? I haven’t tried it with frozen spinach, so I’m not sure how much you can add and not have it affect the flavor. I would start small, with half a cup, and add more if you want to. that looks divine! and theres spinach in it! Please do drop by the Auction fundraiser to help VSPCA,India on my blog, to bid or share. Shipping is available in US, India, and some international. They are an amazing vegan non profit working to rescue cows, calfs, dogs, all animals and also feed vegan meals to the homeless. Looks great! Have you ever tried to make a healthy version of cookie dough dip? Oooh, Susan! It’s summertime in California! Please buy an ice cream maker! I know you would work healthy vegan wonders with it! Totally easy to use and you can buy a good one for $30 or so. Branch out! Go for it! And share your creations with US, your devoted blog-ees!!! Made this tonight; it is delicious! Well I have found several of your recipes that sound really good and I am going to make them. Thank you! The chocolate cherry ice cream from Eat to Live is in my ice cream maker as I type this, and haven’t tried with greens yet. I think I made a mistake though and hope this freezes up. I had fresh cherries for the 4th of July and threw it all together WHILE increasing the qty. Shoot! It might not work, but hoping! If it doesn’t freeze up I’ll dump it back in the Vitamix with some frozen banana. I also use Swiss chard in my veggie smoothies. It gives it a slight taste, but not too overpowering. 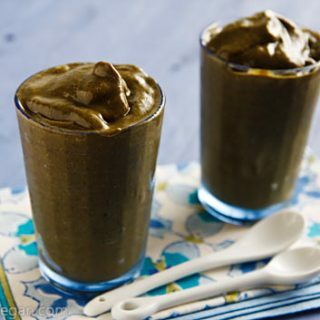 And how awesome to get a sweet, icy treat with an extra nutritional kick! Thank you so much for these delicious recipes. This is the break-in weekend before I start the Live to Eat plan. I’m so excited that I can have something like this. I know this will help me through some rough days where I need to eat some chocolate. Instead of breaking out a chocolate bar, I’ll have this with my organic cacoa powder! It’s nice to know you live close to me also. You understand the cultural issues with eating in the south. Love this, tastes very decedent! Looks good! Watercress is even less noticeable in sweets, I think, and more nutritious to boot! Expensive though.